You are invited to the opening concert "Festival Brikcius" - the chamber music concert series at the Stone Bell House (Spring & Autumn 2012) of the Czech cellist František Brikcius, held on Thursday 19th April 2012, 19.30pm, at representative concert hall from the 13th century, the Stone Bell House (GHMP, 3rd floor, Staroměstské náměstí 605/13, Praha 1, Czech Republic). Cellist František Brikcius will play one of the first published works for solo cello, 7 Ricercari by Domenico Gabrielli (1659 - 1690), III. Suite C-dur for solo cello, BWV 1009, by J. S. Bach (1685 - 1750), Paduana for solo cello by Arthur Honegger (1892 - 1955), written shortly after the end of the Second World War and Saro-Wiwa (2004) for solo cello by Irena Kosíková. 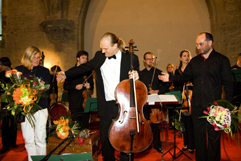 Next spring concert "Festival Brikcius" (Tomáš Víšek - piano & František Brikcius - cello) will be held on Thursday 17th May 2012. Tickets (basic entry fee: 450 CZK / student and senior over 65 years: 250 CZK / maecenas - sponsorship fee: 5 000 CZK) are exclusively available through official festival ticket sales Prague Ticket Office - Via Musica (http://www.PragueTicketOffice.com - Via Musica, AMU, Malostranské náměstí 14, Praha 1 - Via Musica, Staroměstské náměstí 14, Praha 1 - Tel. : +420 224 826 440) and cca 90 minutes before every concert available at the door. Due to the limited number of seats we strongly recommend early booking. Support "Festival Brikcius" and buy maecenas ticket here. 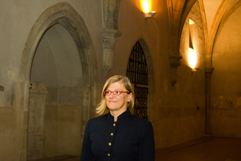 Thursday 19th April 2012, 7:30pm, The Stone Bell House (GHMP, 3rd floor, Staroměstské náměstí 605/13, Praha 1, Czech Republic). Competition: Win 2 x 2 free tickets to the opening concert "Festival Brikcius"
What musical instruments will you hear at the opening concert "Festival Brikcius" featuring cellist František Brikcius? Contest is over, lucky winners are Š. P. and T. N. from Prague. The Gallery of the City of Prague founded in 1963 is the second most important institution for art after the National Gallery in Prague. It is responsible for collecting, preserving and displaying Czech art from the 19th, 20th and 21st centuries. At the same time it is responsible for restoration and erection of monuments, sculptures, memorial tablets and fountains in public places in Prague. One of the many objects of the Gallery of the City of Prague is the Stone Bell House. The house dates back to the second half of the 13th century. The evidence for this oldest stage of construction can be found in the cellar areas. A chapel was constructed sometime around the year 1310 featuring rich figuration and ornamental painted decoration, fragments of which have been preserved to this day. Fundamental modifications to the building were undertaken during the second quarter of the 14th century. It was at this time that a grand town palace was built, a unique and well-preserved example of this type of architecture in Prague. The western façade was richly adorned with Gothic architectural elements and rounded off with notable figural sculpture. The iconographical programme celebrated the image of royalty and the monarchy. Fragments of sculptures discovered during the reconstruction of the building feature the enthroned figures of the king and queen, as well as two guards with sword and shield. Spacious halls were created on the floors of the tower quoin, decorated with Gothic portals with lobes, and a three-piece sedilia. A new sacral area was also created on the first floor, vaulted with quadripartite vaults that featured ornamental keys, all adorned in polychromy and gold plating. In the year 1417 the building sign was preserved on the quoin facing into Týnská Street. The interior was further enriched with painted wooden ceilings in the Renaissance in the 16th century. The fundamental Baroque conversion of the building was then carried out after the year 1685. The façade of the building was modified during the 18th century and access balconies placed around the courtyard. The final stage in the structural development of the building took place during the 1970s. 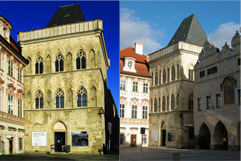 Gothic façades facing into Old Town Square (Staroměstské náměstí) were uncovered, as were a number of architectural elements in the interior and the remains of sculpted and painted decoration. Redevelopment work was completed in 1988 and the building was assigned as the Gallery of the City of Prague. It is here that the most prominent short-term exhibitions are held. Access to exclusive concert hall at the Stone Bell House is possible to the audience of the "Festival Brikcius" concerts. The Gallery of the City of Prague is co-organiser of projects "Duo Brikcius - 2 Cellos Tour" and "Festival Brikcius". František Brikcius: Madame Kosíková, you grew up into the intellectual family of the prohibited philosopher Karel Kosík (1926 - 2003), author of the world famous Dialectics of the Concrete and literary scientist Růžena Grebeníčková, the Herder prize laureate. How do you remember your parents? Irena Kosíková: Some memories are incredible, but they are overwhelmed by beautiful memories. F. B.: You began to learn the organ with Prof. Jan Hora, together with piano lessons given by Prof. Eliška Kleinová and Prof. Arnoštka Grünfeldová. What were your lessons like with Madame Eliška Kleinová, sister of "Terezín" composer Gideon Klein? I. K.: Lessons with Líza Kleinová were surprisingly very personal, she was able to recognize specifics I went through very quickly and respect them while keeping her great pedagogical intention, to lead her students where she wanted. 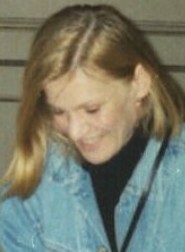 I liked to go to her lessons in Smíchov, because she trusted me. On my graduation concert in Prague she came to me after the concert, it was unforgettable. I liked her very much. She inspired people. F. B.: Your parents were not allowed to publish and they were under constant surveillance of the StB (Czech equivalent of the KGB). You have two children with dissident and signatory of Charta 77, who emigrated in the seventies. Did it affect your professional career? I. K.: It's obvious to everybody who experienced a similar situation. There are not so many people who are aware that the classical music decision-makers are mostly still the same people as in the previous totalitarian regime. It was difficult to keep your own identity. I don't regret anything, but I don't want to look back. F. B.: You studied organ performance with Prof. Jaroslava Potměšilová and conducting with Prof. Karel Fiala at the Ježek's Conservatory. You took private composition lessons with Prof. Miroslav Raichl. How did the legendary composer Miroslav Raichl influence you? I. K.: He didn't at all. F. B.: Finally after the Velvet Revolution you were accepted at the Janáček Academy of Music (JAMU) in Brno into the organ class of Prof. Alena Veselá and Prof. Kamila Klugarová. You graduated at the Academy of Music (HAMU) in Prague, under the guidance of Prof. Josef Popelka. How would you compare the aforementioned schools, teachers and students? I. K.: I don't want to compare, it was for me to receive something from each of them. I did that. F. B.: As part of the Year of Jewish Culture "100 Years of the Jewish Museum in Prague" you created orchestra composition "7 Candles", featured together with music of the "Terezín" composers. Your father was imprisoned in Terezín. What do you think about those compositions? I. K.: They should be performed. F. B.: You specialise in the interpretation of organ works written by Johann Sebastian Bach. Why? What is it about organ concert dramaturgy that is important for you? I. K.: I always have to respect the possibility of each organ. Then, I'm conscious not to play the same repertoire at the same place, if possible. I like to present always some unique selection, featuring contrasting works by J. S. Bach, or on the contrary, complete sets, such as Leipzig Chorals, The Art of Fugue or Organ Mass. F. B.: The recent premiere of your orchestra composition "MAKANNA" commemorated the 110th anniversary of the birth of the Jewish writer Jiří Weil under the auspices of Sir Tom Stoppard and Václav Havel. The concert was well documented and in the foreseeable future will be recorded on CD. What is your relationship to literature? I. K.: I can't imagine life without books. F. B.: What instrument do you play at the moment, what is your favourite organ? I. K.: At home I practise on two manuals electronic organ with a wooden keyboard made by company Johannus. At the moment my favourite organ is in Plaisance made by Mr Daniel Birouste. F. B.: Your compositions have been performed both in the Czech Republic and abroad (Algeria, Belgium, Bosnia and Herzegovina, Bulgaria, Germany, Israel, Poland, Russia, Turkey, Sweden and the United Kingdom). What about your composing is important for you? I. K.: Deadlines. Not only. F. B.: Pen and music paper or computer? F. B.: At the present time you live in France. Have you experienced anything nice recently? I. K.: Last week instruments by John Groot at the Castle Saint Giraud in Gascony. For more information about Irena Kosíková visit http://www.Brikcius.com , http://www.iKosik.com , http://www.FaceBook.com/Kosikova.Irena , http://www.Twitter.com/IrenaKosikova , http://www.GPlus.to/Kosikova and http://En.Wikipedia.org/Wiki/Irena_Kosíková . Concert tickets "Festival Brikcius" - the chamber music concert series at the Stone Bell House are exclusively available through official festival ticket sales Prague Ticket Office - Via Musica (online here) and cca 90 minutes before every concert at the door. Thanks to the limited number of seats we strongly recommend early booking. Support "Festival Brikcius" and buy maecenas ticket/sponsorship fee here.